Driving by a storage facility does not seem to drum much of a reaction out of people. If I drove by a storage facility a year ago, I wouldn’t have given it much of a second thought except for a memory of when I helped my uncle move things into a storage unit when I was eleven. If anything, people tend to think of those reality shows that depict a group of obnoxious people finding questionable items in an auction. That being said, the self-storage industry can be seen as a sort of hidden giant. Although not many people think of those little buildings that house the items of many eccentric people, the industry is booming. The industry made approximately 26 million dollars just last year! It’s fascinating to know that as a nation, we have approximately 50,000 storage facilities compared to the rest of the world (8,000). A commenter facetiously stated, “We are a nation of hoarders.” Although there may be a bit of merit to that statement, it also shows our nation’s ability to capitalize on this need to store our belongings. Many students go to college and need a place to store their belongings, people relocate for their jobs all the time, and some people are looking to get rid of some of the things in their homes. 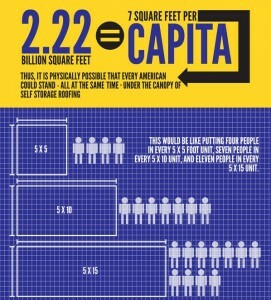 The self-storage industry is here to fulfill this need to store things and will continue to thrive. This infographic serves to educate those that aren’t too familiar with the storage industry. It’s hard to blame anyone as most people’s familiarity with the industry tends to be related to Storage Wars or other related shows. With enough real estate that can house the entire population of the United States, at least whilst standing under the roof of a unit, this industry is nothing to scoff at. Joseph Ver is part of the marketing team at SpareFoot.com. We aim to take the storage industry and modernize it by making it easy for customers to find and book a storage unit. Thinking about renting? Book a storage unit in Dallas through SpareFoot. This entry was posted in Self Storage Expeditions, Storage Industry News and tagged dallas storage, moving dallas, storage facts. Bookmark the permalink.